The device was launched in that South Asian marketplace with a price tag of Rs. 22,990. Samsung has now launched its Galaxy Gear smartwatch, its first wearable tech gadget, into the consumer market in India at a price tag of Rs. 22,990, which is just over $350 U.S. dollars. It is expected to arrive on the shelves of retail stores in India on September 25, 2013. 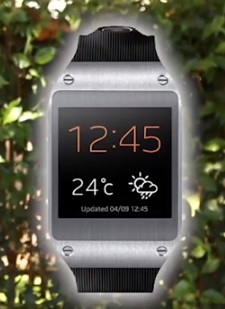 Unlike the occurrence of the Galaxy Note 3 and previous Galaxy Gear pre-order availability expectations, Samsung has issued a confirmation that there will not be any bundled packages, so it will be possible to obtain these gadgets at a reduced price. The smartwatch gadgets are a part of the latest Galaxy Gear line and was launched at IFA 2013. Its launch occurred alongside that of the Samsung Galaxy Note 3 at the same event. The smartwatch gadget has an OLED display of 1.63 inches. It also comes with S voice and it currently functions only with either the Galaxy Note 3 or the Galaxy Note 10.1 2014 Edition, which is a Samsung tablet that also had its official launch at the same event. That said, Samsung has said that it will soon be making its smartwatch compatible with other Galaxy gadgets, such as the Galaxy Note II, the Galaxy SIII, and the Galaxy S4. The smartwatch is also able to display messages, make calls, take photos (with a 1.9 megapixel camera) and record videos. The initial release of this smartwatch comes with 70 apps, which include a number of basic fitness applications, such as a step-counting passometer. However, it is Samsung’s hop that as a growing number of developers begin to create with this device in mind, the range of apps will rapidly increase. The primary challenge of this smartwatch, as is the case with the majority of wearable gadgets, is said to have been approximately 27 hours as per the normal use tests conducted by Samsung. Previously, the first wearable tech gadget from Samsung became available for pre-order alongside the Galaxy Note 3. The Note’s third generation was sold in India for Rs. 49,900 (approximately $775). That device has a 5.7 inch full HD display with Super AMOLED. However, it is considerably lighter and slimmer than the previous generation, as it is only 8.33mm deep, and weighs only 168 grams.